Science has discovered that at the quantum level (the smallest level) everything is made of energy, that our thoughts affect matter and consciousness creates our reality. If at the core of our “physical” world, everything is made of this energy, then there is nothing fundamentally solid about anything. Is there evidence that this is true? And if there is, how can we use that information to change and improve our lives? If you explore what they’ve discovered through the double-slit experiment or read what twentieth-century physicists like Schrodinger and Heisenberg have written about consciousness, you’ll see how there is scientific evidence that our thoughts create reality. Both these Nobel Prize-winning physicists saw a connection between consciousness and reality. Heisenberg is considered to have been an advocate of philosophical idealism. The idealist view holds that nothing has an independent, real essence outside of consciousness, that the objects we perceive are identical with the ideas we have about them, and that it is intelligent life that defines reality. This is a profound concept – one that could be and is radically changing our worldview and many people’s lives. This is one of the most amazing ways I’ve discovered for myself that this is all true. 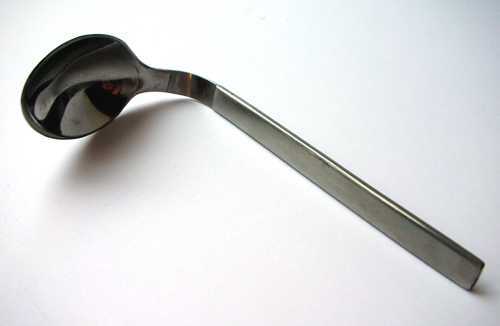 In a spoon-bending class, we were taught by an aerospace engineer that matter is made of energy; that nothing is really solid – unless or until we believe and perceive it as solid. Following his directions, I gently held a spoon by two fingers at the very tip of the bowl and two fingers at the bottom tip of the handle. We were told to imagine the spoon becoming liquid. I became quiet and envisioned that in my mind. Within moments, and using the power of my mind to intensely focus on the belief that it was possible and that the spoon was liquid, I actually felt the spoon turn into a gel-like liquid. I quickly bent the bowl of this previously very rigid, sterling silver spoon. The instant I realized I was damaging the spoon, it froze in my hands. This was one of strangest sensations I’ve ever experienced. One minute the item was solid, then it was a gel-like liquid, then it was a twisted solid—right in my hand. In two other experiments, we were told to envision our spoons just bending over – which, after taking some time to shift my belief about what was possible, was exactly what happened. There were no tricks involved. We didn’t rub the spoon handle until it became hot enough to bend, and we didn’t bend the spoon forcibly under the table – as some critics like to claim in their attempt to debunk this ability. I bent spoons with the power of my consciousness. This experience once again proved to me that “physical” reality is not what we believe it is. If this is possible, what else can we do that we have yet to uncover? What are the limits to our consciousness and to our natural abilities? If you’re interested in learning more detailed information or being guided to be able to do this for yourself, I write more in my book “Infinite You: A Journey to Your Greater Self and Beyond” which you can find at www.LifeColorsCity.com.